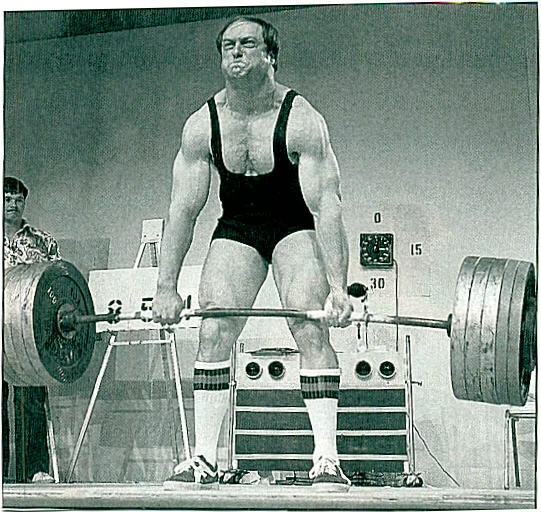 - On August 24th, 1985, the Los Angeles Police Department Powerlifting Team had the privilege of the legendary John Kuc presenting a powerlifting seminar and lifting exhibition. John did his exhibition first, working up to a 'light' squat of 715. He then proceeded to do his deadlift routine, ending with three sets of triples using 715, 745, and 775 lbs. He informed us this was his first heavy deadlift workout since competing in the Drug Free Nationals a month earlier. We were stunned by his strength. Next, Kuc gave a 45 minute lecture covering his routine, cycles, theories and nutritional philosophy. He then stayed and answered questions until there were no more. The next day when I dropped John off at the airport he made me promise to write him and inform him of any negative feedback I got. To this day, all I have heard are positive comments. Lt. John Mutz and I found Kuc's seminar and exhibition well prepared and well executed. Kuc is a professional person in every sense of the word. His fee was very reasonable and we got every penny's worth. We would highly recommend him to any individual or organization considering hiring his services. One last note. On the drug free issue, Kuc never preached or made judgement on others. He merely stated it was his choice to compete in a drug free manner. He was also candid about his prior steroid use. Of all the powerlifting related events that have occurred in my life. the one I am most proud of is calling John Kuc my friend. Your first year of weight training is finished. You should be ready to enter the intermediate training stage. Your body is now developed to the proper level which will enable you to progress through more difficult and advanced training. If you still have any bad lifting habits you should break them now. Bad lifting habits and style can be costly in later years. They are also harder to dispose of then. During the intermediate stage you will be working on powerlifting methods and doing a fair amount of bodybuilding. The weights will become heavier and the repetitions will be lower. You have been training for only one year, so you must expect some aspects of your new training routine to be similar to what you did in your first year. If you have been faithful to the program up to this point you should be in excellent shape. There are, however, many things to experience and your body must undergo much more conditioning. During the next year you will acquire a great deal more conditioning and experience. The intermediate stage is a time when lifters must start thinking for themselves. Entering one or two contests during your second year of training will most assuredly have you doing some fine thinking on your own. The best time to schedule these contests would be at the end of the second four months or the third four months of the intermediate stage. Please do not go into these contests planning to go the limit on your attempts. Remember that you do not have that much experience and your body cannot take the limit attempts yet. For the present a contest should be more of a learning experience instead of a head-to-head competition. How you place in these first two contests does not matter, but what you learn will most definitely affect how you place in future contests. Go into the contest with the idea of winning; just do not let the unfamiliar pressures of your first contest lead you to do anything foolish. Experiencing a contest or two at this stage in your career will give you an idea of contest procedure, competition, following instructions and rules, and applying lifting strategy under actual conditions. Competition will give you a good idea of how training reps relate to what you do in a contest and provide invaluable feedback needed for the next contest. Before you begin your second year, plan to take a week of vacation from the stresses, pain and regimentation of weight training. When you start up again reduce your last training poundages a little. Work back to your best, eventually surpassing it to attain the new goals set for yourself. Why are you entering your second year of training using a power routine consisting of 6 sets of 5 repetitions? The 6x5 routine is not new. It is a popular method of building power for athletes that strength coaches frequently use. Six sets of five reps, if used correctly, builds power relatively fast for an athlete who is conditioned, but not experienced in weight training. The reason you will be using the 6x5 routine is you are in a transition period. You have experience, but are not ready to subject yourself to the continuous pounding and abuse that advanced powerlifting is going to inflict on your body. A compromise is reached between high and low repetitions and light and heavy weight with the potential remaining to develop power. The 6x5 routine has some pitfalls a lifter can consciously or unconsciously fall into. A characteristic of the 6x5 workout is the high number of sets and reps. Properly done, each set should be a progressively heavier weight. If the same weight is handled for each of the six sets progress would eventually stop. For example, if you could easily handle the same weight for 6x5 you could not possibly induce overload in the muscles being worked. The overload principle states that a muscle grows larger or stronger only when required to perform tasks that place loads on it over and above previous requirements. Why can't you achieve overload in the muscles using the same weight for all six sets? In order to complete six sets with the same weight, the weight used would have to be light enough so fatigue would not build and make the last two or three sets impossible. You might ask, "What if I use a weight that is constant for all six sets, but heavy enough to make me work hard enough from the first set through the sixth set?" The first set could be heavy enough to build strength. By the time you have done three or four heavy sets, your body could not handle the remaining sets in good form; even though you were lucky enough to make all the repetitions. The cumulative effect of working out so heavy so often would soon have you ready for the scrap heap. A heavy, high-rep program is highly specialized. It should be used by advanced lifters for only very short periods of time. Severe overwork will occur otherwise. In deciding what weight to start with for the 6x5 system, we have to develop a starting point. The weight you handled in the 3x8 program (the previous program) will be what the starting poundages are based on. The way you will work the routine is use different weight for each set of 5 reps, working from a light weight on the first set of five to medium weights; finally heavier weights on the last sets. The initial sets ease your body into a heavy lifting state. The six sets play a triple role. One is to prepare your body for a heavy lifting state in the safest and easiest way possible. The next is to build strength and the last is to familiarize you with the specific lifting movement through actual experience. I have listed certain poundages in the sample routine. These poundages are to be used only as a rough guideline and must not be interpreted as the poundage you should be using. You may be able to use a lot more weight, or maybe even less. Everyone is different. Each person progresses at their own rate. Try different poundages in the new 6x5 routine. Use the first two or three workouts to experiment. Your first set of fives could be ten, fifteen, twenty pounds heavier than what you finished the 3x8 routine with. The last three sets of five should work you fairly hard. On the last set really make yourself work. I do not mean the gut busting, low gear, nearly static push you see in competitions. That is strictly for maximum single attempts by an experienced lifter. What I am getting at is if you did five reps and were to try a sixth, you would probably not make it. Let's use the squat as an example for adapting the 3x8 routine to the 6x5 routine. Imaginary lifter's progress from the first day of training through the first y ear (beginner's stage). The imaginary lifter finished the first year squatting 3x8@275 lbs. We will take the 275 pound figure and see how it could work in the 6x5 routine.